Grizzly bear viewing on a float trip in Bella Coola through the Great Bear Rainforest. This is an experience like no other. Grizzly bear viewing is a unique experience, I write as we drift down the river in a small non-motorized boat looking down the river for something big, brown and “grizzled.” I’m in the heart of British Columbia’s Great Bear Rainforest of Bella Coola, a breathtaking valley that comprises everything I dreamed the Canadian Wilderness would encompass. Towering mountains rising from the ocean floor. Hanging valleys appear with glaciers descending. Pristine rivers mark the way through giant cedar trees rising from the moss-covered forest floor. We are treated to views of grizzly bears, black bears, soaring bald eagles and more bears. Until now I did not know that “grizzled” is a word that refers to a lighter grey color or silver tip. This is a distinctive feature of the frosted hairs at the tips the fur that gave Grizzly Bears their name. From a distance, they look silver with this defining tone of lighter color on their backs. This is an excellent tip to keep in mind when trying to distinguish between black bear and grizzly bears. Both grizzlies and black bears range in color, depending on their environment and food sources. Grizzly bears also have another distinctive feature — a hump on their backs. In comparison, the back of a black bear is rounded. An eager cub learns the ropes of salmon fishing from the professionals. 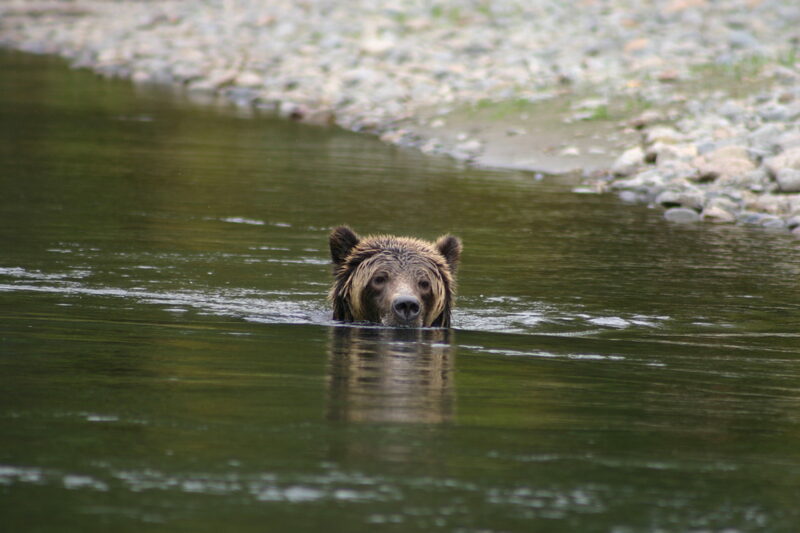 Back to grizzly bear viewing as I drift down the river in Bella Coola, BC. I notice a brown-looking mound to my right and soon realize with excitement that it was only a log. With a nervous yet childlike excitement in my belly, along with my fellow grizzly bear viewing friends, I started to wonder. I wanted to know more facts about grizzly bears, such as what do grizzly bears eat? As we continue drifting with the flow of salmon on the Atnarko River, our professional grizzly bear viewing guide, Fraser, educates us on these special creatures of the Great Bear Rainforest. Grizzly bears are omnivores which mean their diet can vary immensely. Generally, a grizzly bear may forage on nuts, seeds, grasses, roots, dead animals, fish and smaller animals such as deer and even a large moose. 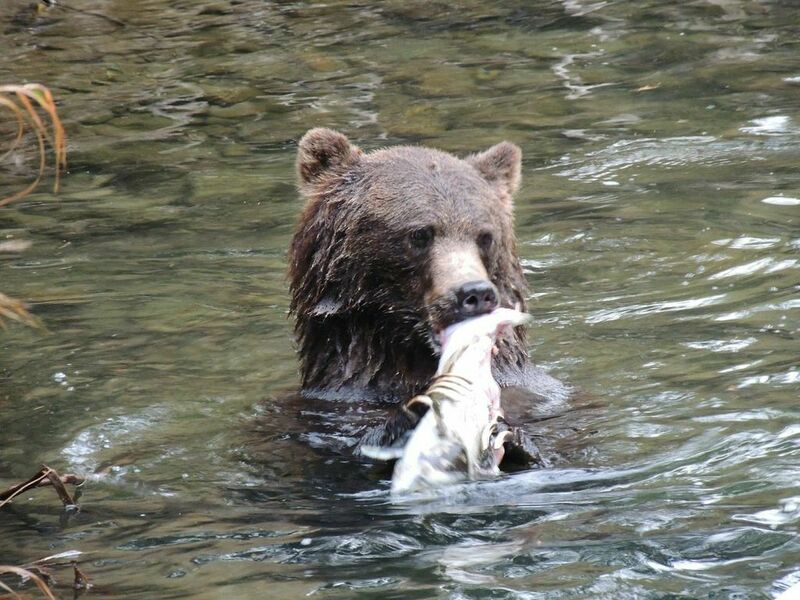 This time of year, in late August and early September, the bears have come down from the alpine meadows to feed on the abundance of the salmon runs. The rivers in the Coast Mountains team with Pink and Coho Salmon. You could literally walk across the Atnarko River across the slippery backs of thousands of salmon all making their way to their final moment in life — to breed and then to die. They finish their incredible lifelong journey at sea by returning to the river they were born in. Seeing that many salmon in one area is in itself something of the marvelous. The riverbank becomes a table as the endless feast passes in the Atnarko River. And just like that, I spot another mound. It wasn’t a log this time. It was a grizzly bear, live and beautiful, feeding along the shores of the river bank. A female, known as a sow, comes down the shoreline, her broad backside bobbing in the river flow. I am pondering how an animal this large can stay afloat as she suddenly duck-dives underwater leaving us with only her back paws visible to photograph. I had no idea a grizzly bear could swim so well, or would go underwater like this. Apparently, Grizzly Bears have a multitude of strengths. They can run faster than 35kms/hour, actually outpacing a racehorse in short distances. Our guide is a local biologist from Bella Coola. He tells us he has grown up on this river where his father starting a grizzly bear viewing business back in the day. “Grizzly bears have the agility of a house cat,” he says. “Think of them as a 1,000-pound house cat.” I calculated that in my mind, and soon realized how well bears can actually move. Well, that was enough for me to become even more astounded by just how amazing these animals are. You can hear the crunch of massive jaws devouring the salmon. There are many things said about grizzly bears that I now realize are more gossip than fact — such as their inability to run downhill or be able to see well. These are the kings of the forest. The truth about Grizzly Bears is, not only can they outrun any human downhill, they’ll do it with speed and grace in any direction and through the most treacherous terrain. If you think they can’t see you, they don’t need to because they have an ultra-sensitive sense of smell. In fact, their sense of smell is 30 times stronger than that of a hound dog. So this is the reason no one brings a toothbrush into their tent! 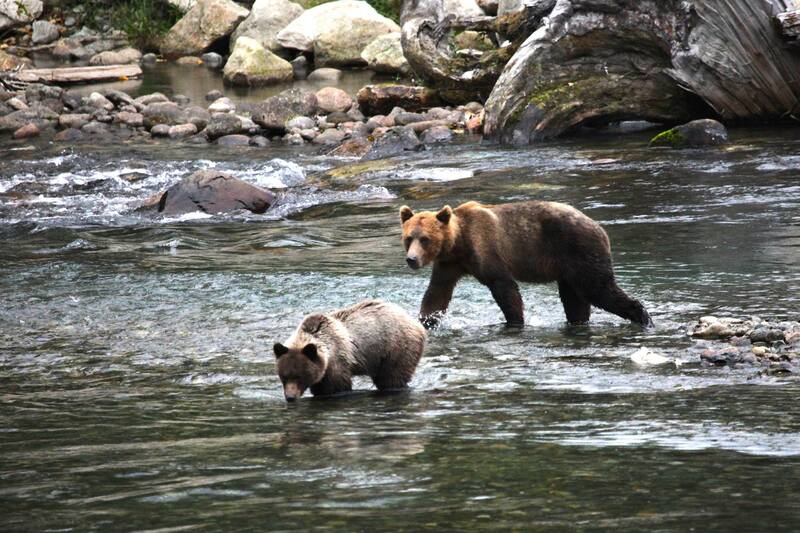 Grizzly bears are incredible swimmers. Amazing to imagine the water can support this 1,000-pound beast. The sow finally popped back to the surface and there she was amongst us in the water about five meters away. I am actually seeing a grizzly bear in its natural habitat. This is such an experience to view the great creature of the Canadian wilds doing her thing. Most Canadians will never get the chance to see a grizzly bear in the wild. Not only are they the kings and queens of the great wilderness, they are becoming more endangered every year. The factors that endanger them include being one of the slowest reproducing land mammals on earth. Let’s not forget the fact that up until 2017, trophy hunting was still allowed by BC’s government. Fortunately, the long fight to end such hunting has officially ended on a successful note — with much relief for us and many across the globe. We were warned not to use the flash on our cameras along with a multitude of additional safety precautions prior to boarding the boat. The presence and guidance of our local grizzly bear viewing guides help us remember. 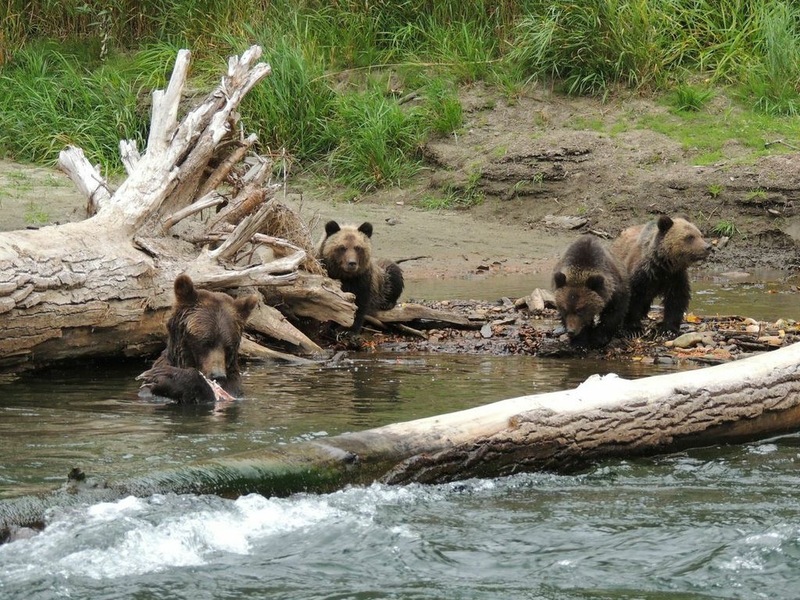 These bears are not habituated but many of them return to this same river each year for the Salmon run. They are familiar with the rafts as well as boats and other movements in the river. They also seem to understand the movements of these rafts and other things on the river. Our local guide ensures the number one priority is the wellbeing of the bears. They practice their operations by a strict rule of conduct that enables grizzly bears and other wildlife to have their space, eat in peace, and not be disturbed by the tourism of grizzly bear viewing. 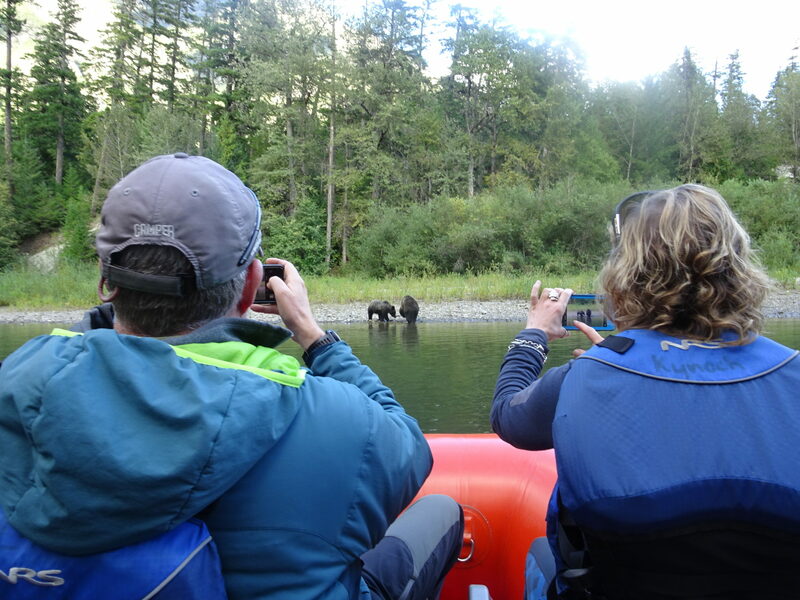 Bear Tours are limited per daily volume, the number of boats allowed on the river, times of day, and tour operator qualifications. I reckon we’re floating with one of the best as his unending wealth of knowledge about grizzly bears and other Bears in Canada is eye-opening and very intriguing. Since his father had been running Bear Tours In the Great Bear for years with his son Fraser, they have some exciting tales from years of combined experiences on this river in Bella Coola, BC. Some other interesting facts about Grizzly Bears is their need to eat a lot during the summer and fall months in order to gain enough of a healthy weight to get them through the long winter in the den. This is especially true of females preparing to have cubs. Mating season is in May and June. The female’s body will not implant the egg in her uterus unless she has reached an ideal amount of body fat by October or November. This delayed implantation occurs only when or if she has managed to gain enough weight. So it is inherently crucial for a grizzly bear’s survival and reproduction process to ensure they have enough fat reserves on them for survival through the denning process (aka hibernation). A mom and her cubs enjoy a hearty meal of salmon. We sit and we enjoy the experience of grizzly bear viewing in their natural habitat, enjoying a good feast on salmon, and watching their skills as they race and dive on a new catch. A young cub emerges from the bushes before us, and cautiously makes its way to feed on what mum has successfully caught. The quickly devours the catch, and mum returns to the river for more. It’s truly an amazing experience drifting and grizzly bear viewing in the breathtaking Coast Mountains of BC. The group stays anchored in the boat for a good 15 minutes. It is because our guide is waiting for a grizzly bear to move on without any stress from us onlookers. “The bears rule the river,” says Fraser. “We’re just here to enjoy them from a safe and respectful distance. We may be here a while.” On board, we are more than happy to spend the day grizzly bear viewing in one of the most beautiful places in Western Canada. I knew my Canadian adventure tour wouldn’t be complete without seeing a bear. I am grateful to have viewed a grizzly. It’s not uncommon for these bear tours to run over the scheduled time frame. 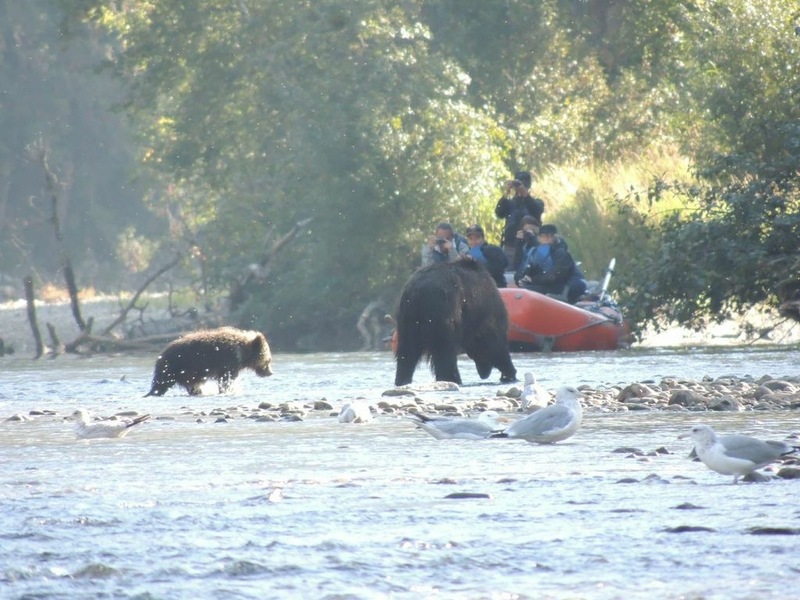 A sure delay when you’ve got a grizzly bear mid-river having a good feed. We wait while mom and cub finish feeding before continuing down the river so as not to disturb them. Eventually, the sow and cub retreat to the bushes for a respite from the limelight and a well-deserved nap. We pull anchor and drift onwards. A pair of bald eagles soars overhead and lands in a nearby nest. Of course, they will enjoy a snack of decayed salmon at their high perch. This wilderness wildlife tour feels like we have stepped into National Geographic. I look around the boat. I see smiling faces and hear the low chatter of the excitement shared between us Bear viewers today. The experience of viewing these incredible creatures in the British Columbia wilds amazes us all. We may have some incredible photos, but in the end, it is about putting down the camera and actually watching. This is the way grizzly bears behave naturally in their environment in the Great Bear Rainforest and surrounding wilderness. It’s about stepping into experiences that touch the heart and leave your soul feeling inspired and invigorated. That is how I felt drifting down the river with grizzly bears on today’s wildlife viewing tour. You, too, can journey into British Columbia’s most beautiful wilderness valleys of Bella Coola in the Cariboo Chilcotin Coast Region. This is where an abundance of unique wildlife viewing opportunities await. 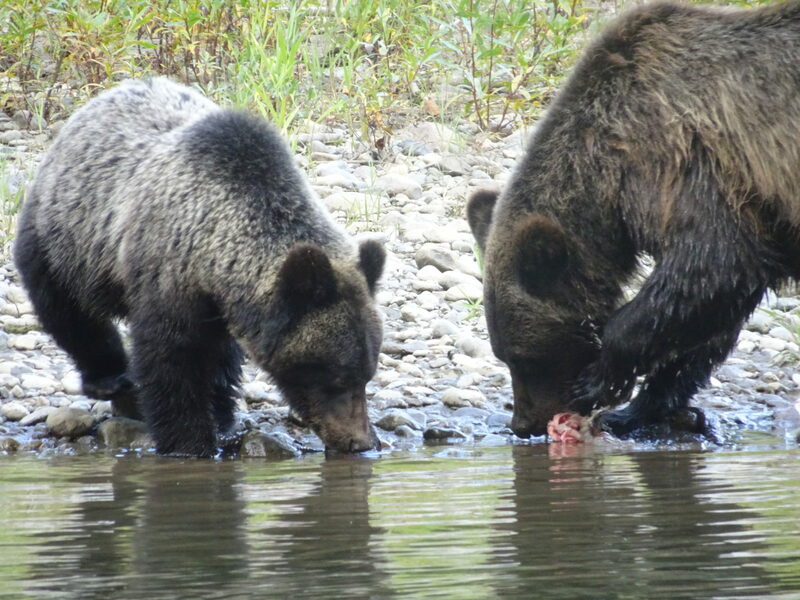 Grizzly bear tours are organized with the very best local biologist guides of the Bella Coola Valley and take place in late August and September. These tours book up fast so reserve your spot now. To experience one of Yoho Adventures unique Canadian hiking vacations, contact the Yoho Adventures team. Find out how you can join us away from the tourist traps and away from the well-trodden trails. 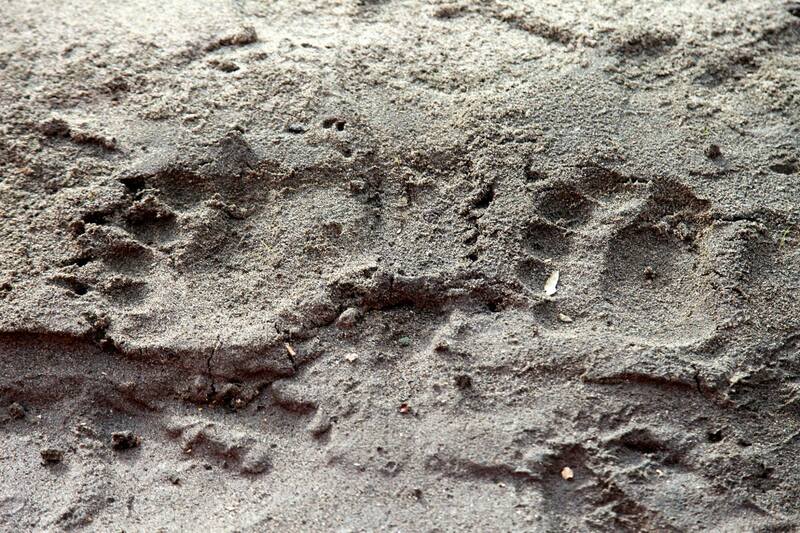 Bear tracks in the sandy river bank.